Eye On Tampa Bay: Who's the "godless communist?" If you follow the intersection of social media and politics around Tampa Bay, you know Hillsborough County Commissioner and Chairman Mark Sharpe is a big social media user on both Twitter (@MarkSharpeFL), and Facebook, and even attempted some periodic blogging at Tumblr, which now appears fallow. But there's some interesting weird writing there... but we'll save that for another day. His key themes recently have been around innovation in Tampa, economic development, more work to do, and of course transportation. He was one of the main forces behind the failed 2010 transportation rail referendum, and has yet to let up. It's good that Sharpe is engaged in social media, and he does put himself out there for everyone to connect with him. Whether he agrees with you or not, he's accessible, and engages... unlike most of our leaders, he lays it out, and lets you make the judgement. But he really does not listen. He is out there, but he really does not use social media to learn from his constituents, but to use it as his bully pulpit. And recently, emphasis on bully. 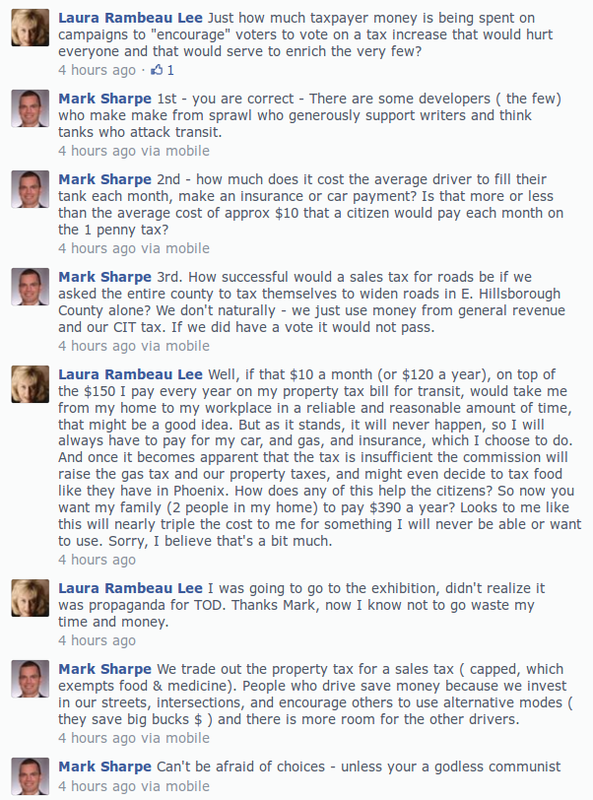 Mark Sharpe on Facebook calling a constituent a "godless communist"
Not getting his way, on January 4th, 2014, he called constituent Laura Rambeau Lee a "godless communist" since she questioned his judgement, provided some counter points and actually cited some real numbers... something he never does. How is this moving the discussion forward? Is he really convincing anyone to embrace his point of view with those comments? Public name calling of a constituent by the Chairman of the Hillsborough County Commission is rather unbecoming, don't you think? 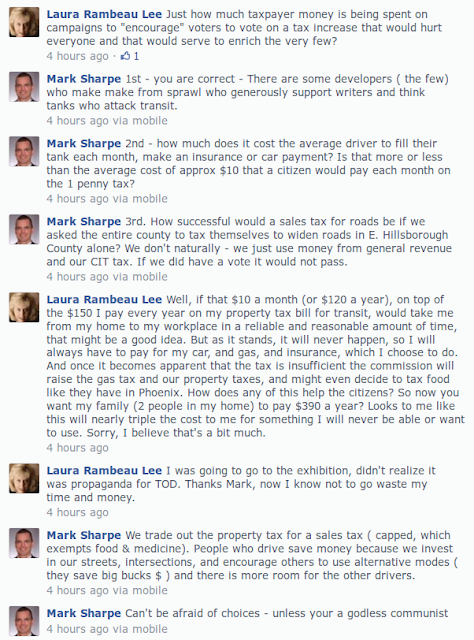 Not to get into the argument between Lee and Sharpe here, but he has no idea about "choice" when the government forces taxation upon its citizens subjects... government is force (try not paying taxes that fund something you disagree with)... to pay for a socialized community rail transportation project. Who's really the "godless communist"?